We are a Top 5 Finalist for Best Workplace in BC! Holy Sh!t Mom! We’re a Top 5 Finalist for Best Workplace in BC. Woo Hoo! We are a Top 5 Finalist for Best Workplace in BC! Four weeks. That is less than one month. My mom used to say, “Count the sleeps” and it will make the time go by faster. 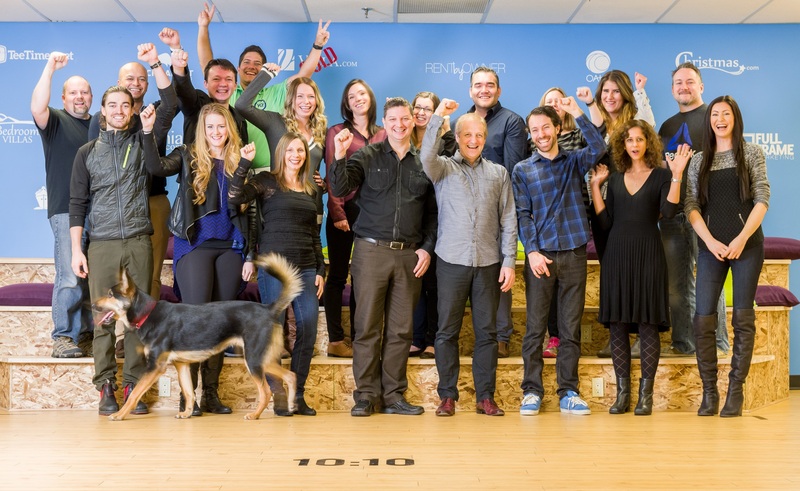 As per the wonderful news that was announced today, our team of Lefties has just been named one of the Top 5 in the Small Business BC Awards in the category of Best Workplace. The Awards Ceremony takes place on February 25. That is only 28 days away. To help pass the time, I thought I would share the application that our team wrote explaining what life is like at Left. Since inception in 2010, we have been guided by 10 core values that foster and support creativity and employee well being in all that we do. We “Lefties” believe strongly in the philosophy that healthy and happy employees have far greater potential of producing incredible work. As such, our commitment to health and wellness is woven through daily decisions. Flexible hours to accommodate school & daycare dropoff/pickup. 18 Vacation/Personal/sick days per year. Ergonomic adjustable chairs, optional stand-up desks, and ergonomic keyboards/mice, monitor stands, etc. Informal/structured mentoring available for all employees. Cooking meals at Ronald McDonald House. Adoption of a local family through Christmas hamper drive. ToughMudder Whistler, supporting the Wounded Warriors Project, including weekly fitness sessions. We got fit. We gave back. We bonded. Every Lefty gained a sense of pride and personal accomplishment. We have a dedicated Employee Experience Manager who champions our culture and creates an employee experience that promotes happy, healthy, inspiring, and passionate Lefties. The very essence of our brand is reflected by living our 10 Core Values. With our Legendary Lefty program, employees nominate peers whenever they feel the colleague has demonstrated or lived a core value. Every month, one “Legendary Lefty” is chosen from their numerous peer nominations. It is clear from these commendations that our Lefties truly believe in and relate to the company’s core values. Links, stories, media mentions, photos, and videos about our breakthrough product YO! and how it is allowing every Lefty to make their Mark. Anchored by our core values, Left of the Dot is a double unicorn-in-the-making. Yes, we are growing, but we are doubly rare as we have always placed an emphasis on “what do we have our people becoming” vs. just “what do we have our people doing”. We feel if our people become more they will achieve more and thus impact more lives. Health and wellness—both physical and mental—is a big anchor for this and one we are very proud of. Supporting each other through health and wellness initiatives will always result in immeasurable dividends via personal, socioeconomic, and environmental benefits. Although we will grow larger as we continue to expand and innovate, our belief in our people’s health and wellness and our love, care, and hope for the community, will remain a core value. We sincerely thank you for your consideration to be recognized as BC’s Best Workplace. While there are a lot of great companies out there, I think our team of Lefties is the best there is. And whatever the outcome, I am sure we will win the after party.